Last week a storm forced me to cut my shopping trip short, and that meant no ALDI shopping. I did not really need anything at ALDI though, but I sure was glad to return to the reasonable prices at ALDI this week. Two weeks ago I stocked up on cheap chicken at ALDI, so this week I ended up splurging on some expensive beef stew meat. 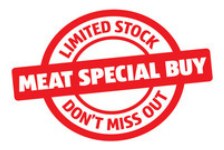 This week the Wednesday Meat Deal is a little beefy...The Aldi meat special is available Wednesday May 30th. Aldi also has some great price cuts on chicken this week with prices as low as $0.99/lb. There are lots of new Aldi price cuts this week, and a lot of lowered prices have been added since last week. I love the ALDI Kaiser Buns price cut, and I might just pick up some cheese wedges as well. You can see the Aldi Price Cuts here. Have you tried any of the products that are on price cut this week? The chicken sale continues at Aldi this week, with the Aldi meat special is available Wednesday May 23rd. I am definitely going over budget this week, but when I saw that Aldi had some great chicken price cuts, I knew it was time to fill up the freezer. The price cuts are not huge, but in the long run it means great savings, and I ended up buying more than 17 lbs of chicken. I also picked up four lbs of chicken at Target for an even better price, and amazingly my small freezer was able to fit all 21 lbs of chicken....after some organizing. The price advertised on the shelves did not include the Aldi chicken price cuts, but if you look at the individual packages you will see the price cut. As a vegetarian I hate cutting up chicken, but it makes it so much easier. If I cut up the chicken, when I bring it home, it is much easier to make chicken curry for the guys in my life. I ended up splitting the 17 lbs of chicken into 15 dinners, which means I spent about $1.36 on meat per dinner. This very frugal price on chicken, will make room for a few luxury meals with beef or shrimp this month. I would love to hear how you did on your shopping this week. You can link up below, or you can share your savings in the comments. This week's Florida Aldi produce prices is all about the produce. There are lots of new Aldi price cuts this week, and they include great price cuts on chicken. My family gets most of our chicken from Aldi, so this is definitely great news. Today I was in and out of ALDI in a matter of a few minutes, because all I really needed was my youngest son's favorite oatmeal....he just cannot live without it. Thanks to price matching at Walmart, and a full pantry I really did not need to do a lot of shopping at ALDI though. Now, if ALDI had not been on my walking route, I'd probably just have skipped it. However, it was just a short walk, and the extra exercise did not hurt me. Aldi eggs were actually cheap this week at $1.09 for a dozen, but I price matched Western Beef's $0.79 price at Walmart instead. I was hoping to finally get the grocery price comparison updated (you can see the latest Aldi price list here), but my middle son had field day at school, so I did not go shopping until afterwards. Total saved $2 compared to my regular grocery stores. How much are eggs at your local Aldi store? I made a quick stop at ALDI this morning, but of course the cart was filled up faster than I had planned. This week's weekly Aldi meat special is available Wednesday May 2nd. We only have one new item on the Aldi price cut list this week, but I personally love how the price cut items stay for longer than they did in the past. We also still have a price cut on ALDI orange juice (check out my review), and there is a little bit for everyone.